Open the fridge. Stare at the contents. Open the crisper drawers. Move a few things around. Open the cabinet. Stare at the contents. Return to the fridge. Complain to the cats that I didn’t want to eat anything in the fridge. Press the tofu in the fridge overnight to get rid of excess moisture. Slice into 8-10 slices of roughly equal sizes, then marinate in the remaining ingredients for 30 minutes to one hour, then broil until cooked through and golden, about 10 minutes on each side. In a medium saute pan, melt the butter, then add the garlic and saute until golden. Add your sprouts and cook over medium heat until a little golden and a little wilted. I find it’s helpful to cover the sprouts to help them sweat a bit. Yum yum. Preheat your oven to 375. Take a small acorn squash. Cut it in half with a sharp knife. 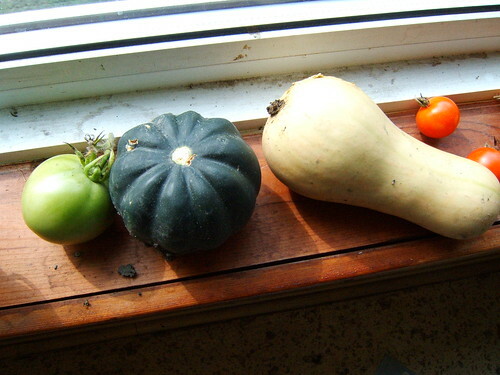 It’s probably safest to cut off the top so that you have a flat surface and the squash doesn’t rock around. Place your squash halves on a baking sheet and add a spoonful of brown sugar to each half. Top each half with a thin slice of pancetta, then place in the oven. Forget about it for an hour or so until your house smells amazing. The pancetta will be crispy, and the interior of the squash flavorful from the rendered fat and the brown sugar. You might want a pinch of salt, but that’s about all you’ll need. Long story short: I’m glad Shane’s home and that we can go back to eating like civilized people. Next > 0925 Corn Chowder and an Attempted Robbery! Hey! Pancetta squash?!? Sounds like we left a day too early.